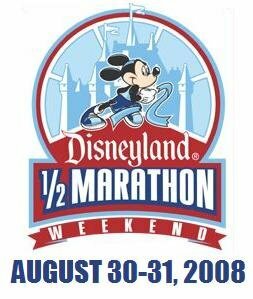 The Disneyland Half Marathon is less than a month away now. I am getting very excited for this race and am so glad that it has an early start time. Otherwise, the heat would kill me! I have heard mixed reviews about this race and I will try to go to the starting line with an open mind. I have heard that it is a very crowded run because it is a popular race and many non-runners like to partake in the fun. I am all for everyone getting their run/walk on but it is very hard when you are four miles into the race and you are still navigating through walkers and large packs moving slower than you are. I have also heard that this race is miserable if it is hot (that is why it has an earlier start time, to avoid the heat). Hopefully come August 31, the weather will be nice and there will be a slightly chilled breeze throughout Anaheim. It is going to be so exhilarating though, to run through the park in the six o’clock hour! Disneyland will look so much different when it is that empty compared to how it typically is. There is just something about Disneyland that is so magical and so I am hoping that the Disney magic carries on throughout this race and helps me run in the time I am shooting for. This entry was posted in Half Marathons, Training. Bookmark the permalink.